We've developed a bit of an odd ritual when supper time comes around. When our plates are ready, I'll present Marleau's food to him. That's the normal and sensible part. Then my husband and I commence eating but also (inexplicably and irrationally) race the dog to see who can finish the meal first. It certainly didn't start out this way and we know it's ridiculous, but we're both very fast eaters, and Marleau doesn't seem to know what to do with himself once he's finished. Pups usually wins, but I'm proud to say we've given him some tight competition a few times. *Use this coupon to save $4.00 on Nutrish DISH through the end of this year. You can print it twice, but it must be redeemed in-store. One thing in Marleau's favor is the fact that his food is delicious (that's not to say ours isn't!). Our latest cuisine is Rachael Ray™ Nutrish® DISH Chicken & Brown Rice Recipe (DISH Beef & Brown Rice Recipe is also available). Real farm-raised chicken is the first ingredient, and the food is safely made using whole ingredients. I'm willing to bet that you're familiar with Rachael Ray, but some of you might not realize how involved she is with pet care and nutrition. She created Nutrish super-premium food and treats for dogs inspired by recipes from her own kitchen in 2007, and these recipes are made with simple, wholesome ingredients like real meat or fish, and don't contain poultry by-product meal or fillers. 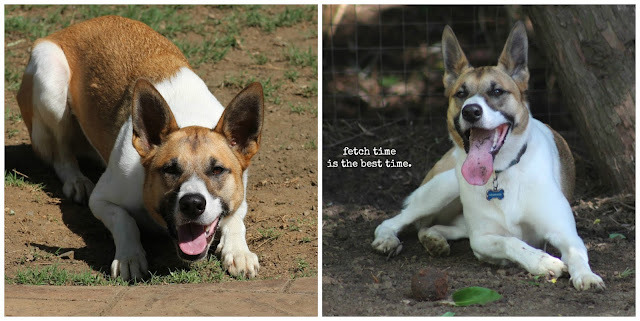 Further, she created Rachael’s Rescue® for all of the seemingly forgotten dogs and cats that might not have someone who loves them as much as they deserve. A portion of proceeds from each sale of Nutrish is donated to The Rachael Ray Foundation, which helps animals in need through Rachael’s Rescue. Through December 2016, Rachael’s Rescue has donated more than $17.5 million to pet charities and other organizations that do good for animals. The funds are used for food, medical supplies, treatments, and more for animals in need. This is a cause near and dear to my heart, and our decision to rescue Marleau is reaffirmed every single day. Note: If your dog is already eating another food but you'd like to try Nutrish DISH, be sure to gradually introduce it by incorporating it into your current dog food over the course of 7-10 days. 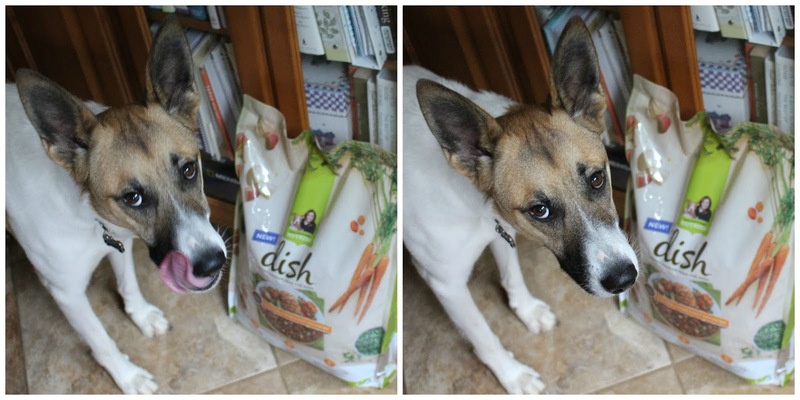 Slowly replace your dog’s current food with Nutrish DISH until it’s completely switched over. For more information about this awesome dog food, check out the Facebook page, Twitter account, or look at a bunch of cute critters on Instagram! I should tell you about this dish! Since Marleau's food contains brown rice and has actual dried peas and carrot slices scattered throughout it, I was inspired to make a chicken pot pie filling and simply serve it over rice. This is so easy to make and delivers all of the comforting overtones of an actual chicken pot pie--it's a keeper! Add the chicken and vegetable mixture and stir into the sauce until everything is coated. Divide the rice between two plates and top with chicken mixture. Serve immediately. Thumbs for Rachael Ray! Love your creation of chicken pot pie in free form..delicious, quick and easy! Marleau's sweet face just makes me smile :). I could never race my dog eating because she'd beat me without much contest. I didn't know Rachael Ray donates to dog rescues. That makes me love her even more! Mastiffs are different from normal dogs;they eat more like cats. I always had to bribe them with some people food, or they'd just starve. Bebop is like that, too. It must be nice to feed Marleau and know he'll be in the clean plate club posthaste! Your pot pie filling is genius. I didn't realise that she was involved with animal causes but that's really nice and that's a really significant amount of money donated too! Thats a lovely story and I am glad you are supporting her grace. Now, you must stop eating so fast you will teach the baby bad habits! Did not know that about Rachael ray, good for her. I like the fact that the food has actual peas in it. I made a chicken pot pie last night & I like peas and corn in mine too. Serving it over brown rice looks tasty! Wow, that's incredible how many millions Rachael Ray's foundation has donated to pet charities. Kudos to her for helping so many animals in need. Thanks for your sweet comment, Grace. You've been a constant supporter since I began and I so appreciate your friendship. I'm 80 years old...definitely time to move on! I'll visit from time to time. This is kind of why I sometimes wish I was a dog not a cat person. You just can't do a good "cat eating" story.